A few days ago I did a Quick Sip review of Anchor Liberty Ale over on the Queen City Drinks Facebook page. If you haven’t liked us on Facebook yet now is a great time to do it so you can keep up to date with the quick sip reviews. 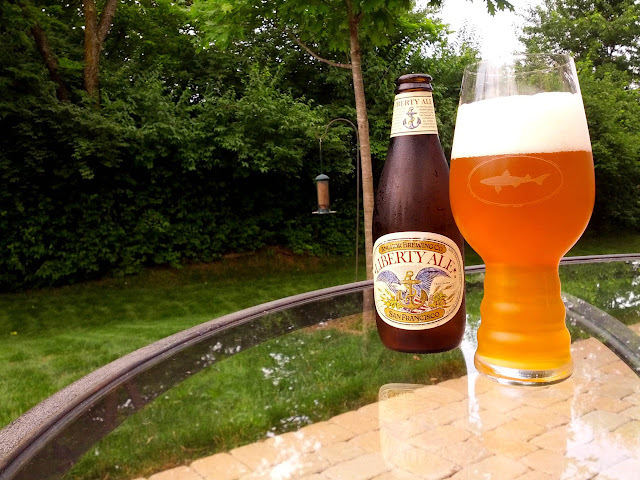 I enjoyed this beer so much that I felt compelled to give it a full blog post. But it isn’t just a tasty beverage, it has a significant history to it! In the far distant past of the mid-1960s, the American craft beer scene was non-existent. Anchor Brewing Company in San Francisco had gone through many owners throughout the years until Fritz Maytag (of the washing machine family) bought the place in 1965. By the mid-1970s, there was a minuscule craft beer scene. There was also tremendous amounts of preparation for America’s bicentennial. Almost everyone was working on something special for July 4th, 1976 but Fritz didn’t want to get lost in the wash (intentional pun) of competition, so he opted to celebrate the 200th anniversary of Paul Revere’s ride. To do this, they created their Liberty Ale, which used something new and relatively unheard of then, an American hop called Cascade. There were some hops grown in America, but they were mostly bittering hops and the aroma hops were coming from England or Germany. That changed when a USDA researcher created hop 56013. Hop 56013 would, in 1972 be first used by Coors, and eventually be called Cascade, and as of this week became the second most grown hop in America. Fritz Maytag discovered this hop and decided it would make his Liberty Ale stand out. It became the first American craft beer to use cascades and the first American craft IPA. That decision is the proverbial butterfly wing that created a tidal wave of Cascade use in almost all American pale ales and India pale ales. Excellent history and all but is this beer any good? Liberty Ale is a delicious 6% IPA with a superbly bountiful aroma of citrus and flowers owed entirely to the little hop that could, Cascade. If you’ve got yard work to do or a grill out to go to this summer, I strongly recommend picking up a six-pack of this to enjoy! It should be available at any better beer store this summer, or any time of year.